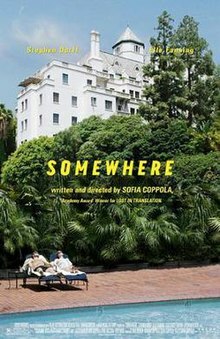 Written and Directed by Sofia Coppolla, and starring Stephen Dorff, Somewhere is the type of movie that aims to be bigger than simple entertainment. No, it wants to be a major statement about fame and the ennui of celebrity. Unfortunately, my when the film opened with Stephen Dorff, as Johnny Marco, endlessly driving a sports car on a dirt track, Vincent Gallo’s Brown Bunny came to mind, which is probably not a comparrison Sofia Coppolla wishes were made. And even though there were parts of Somewhere that I truly enjoyed, such as the scenes between father and daughter where they truly seemed to be bonding, many other parts of the film were just as slow and leaden as Brown Bunny, the only difference is at least Brown Bunny had that blow-job, while Somewhere had Stephen Dorff walking down a country road.